The Cantua Creek Road Race marked the beginning of the 2019 race calendar. This was a 70 mile, 3-lap out-and-back style course on mostly flat roads with some rolling climbs at the end of each lap. This race is generally the first part of a two-race weekend put on by Velo Promo, with the second race being Pine Flats. Unfortunately, due to weather and road conditions, Velo Promo decided to cancel Pine Flats earlier in the week. That was a bit of a bummer because that race is honestly much more interesting, both in terms of scenery and course profile, than Cantua Creek. Race start was at 8 am, and with the weather we’ve been having lately, it was quite cool and wet. The field size was fairly small, with 18 starters, I believe. Colin Patterson of Marc Pro was on the start list, and knowing that he won the P/1/2 race here last year, I knew he was someone to keep an eye on. I had two Simple Green teammates joining me — Jason Francia and Adam O’Camb — so we talked a bit of strategy before the race. I told them I was pretty sure nothing would happen the first lap, and that all the serious moves would happen on the climbs at the end of each lap. Unfortunately Adam forgot his cycling shoes; he borrowed mine, but they were two sizes too small and Adam made the right call to pull out of the race at the end of the first lap when we started to have some knee and foot pain. Even just one teammate can help take some pressure off during the race, so I was happy to be on the start line with Jason. Too my surprise, a few attacks started going within the first few miles, and by 5 or 6 miles in, I found myself in the front half of a split in the field. Jason was with me in the front group of 9. This turned out to be a good scenario, I think, because once we saw we had the gap everyone started working well together in a paceline. At the end of the first lap I was ready for a move to go up the climbs, but since the group was working well, everyone seemed content to ride along like this for another lap. It wasn’t until the second half of the second lap that the group started to get unorganized and there were a few attacks. We were still a group of 9, however, by the time we reached the climb the second time around. Colin began to up the tempo and started to string out the group, but no one had fallen off. Finally, I decided to put in a hard couple of minutes to blow it up. At the turnaround at the top, we were down to 5. I yelled to the group to keep rotating, and they followed along, putting in a large gap between the chasers. Fortunately, this smaller group also worked well together until the final climbs on the last lap. Last year I went way too soon and ended up getting beat pretty soundly in the final sprint against Eric Sasse. This time I told myself to be patient, and I did a good job on the lower slopes. We had a tailwind and I was second wheel going into one of the final kickers. I knew the guy on the front would try to put me in the wind soon, so I decided to kick from there. Looking at Tyler Pearce’s footage (see the Instagram post), I actually had a larger gap than I thought I did. Like last year, however, it was just too soon and Colin and Tyler eventually tracked me down. Regardless, I’m happy with another P/1/2 podium finish to kick off the new year of racing. Next I will be at the UCLA Road Race, which is a course that suits me well, but the field will be very strong. Looking forward to it! The 805 Thousand Oaks Grand Prix on July 7-8 was a great opportunity to compete in my first two Pro/Cat 1/Cat 2 fields. Saturday was a circuit race and Sunday was a criterium, both 80 minutes long in the hot afternoon sun.? ?Saturday was well north of 100?? F in the early afternoon, and dipped just under that by the time we went off at 4 pm. I raced alongside Simple Green teammate Adam O’Camb. Teammate Jason Francia also came down for the race weekend, competing in the Cat 3 field. My daughter Lilly came out to watch me race! Sunday was a crit that was still a bit lumpy and not your typical flat, four corner course. The 40-man field was stronger than Saturday?? ?s field and included some real studs like Justin and Cory Williams; Rahsaan Bahati and some Methods to Winning teammates; and a handful of SoCalCycling.com Team riders. After reviewing Saturday?? ?s race with my teammate Jason Francia, I agreed to sit in a lot more. I had a plan not to go for any moves in the first 30 minutes of the race (total race time was 75 minutes). After 16 of mostly sitting in, however, I found myself on the wheel of another rider that was making a push for a break. Since all I had to do was sit on his wheel, I decided this was an opportunity too good to pass up and I went with it. Soon we had separation from the field, and because I hadn?? ?t made a push to get in the break, I was feeling fresh and ready to do some work. Eventually we were a group of six guys and we worked together fairly well to build our gap to the main bunch to over a minute. The hard pace in the heat was wearing on some of the riders, and a couple of the guys dropped out of the break as we started to wind up towards the finish. Going up the hill heading into one lap to go, I was at the back of the group and decided to carry my speed by attacking hard. Going over the top I had a few bike lengths over second place Cory Williams. I knew that he would out sprint me if I pulled him to the line, so I drilled it to the turn on the far side of the course where we turned into a?? head wind. Cory knows how to race (he is nation?? ?s number one beast, after all) and he made sure he was on my wheel before that turn. Going for it with one lap to go! Overall I was very pleased with my first weekend of racing with the? ?big boys. Can’t wait to get out there on a tough road race course and see what I can do! In March I wrote about my quick journey to upgrading to Cat 3 (check out this post and this one if you want to follow the story from the “beginning”). A few months on and I am now a Cat 2! 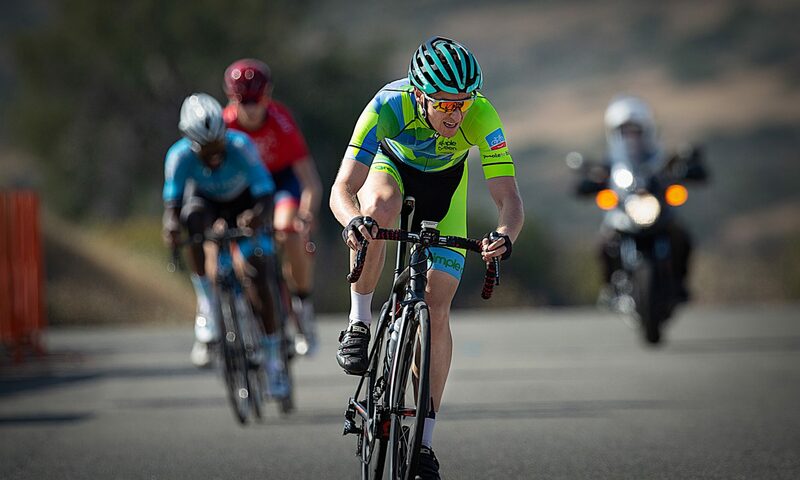 My first race as a Cat 3 was a big one — the San Dimas Stage Race. This race suits me well, with an uphill TT on Stage 1, a lumpy road race on Stage 2, and a crit on Stage 3. The goal was to get the lead on the uphill TT and hold onto it, which is exactly what happened! I won the TT up Glendora Mountain Road by 13 seconds over 2nd and 27 over 3rd (Strava). Stage 2 was rather hectic in the yellow jersey, but thanks to some help from my Team Simple Green teammates Jason Francia and Bradley Wiggs, I was able to finish in the front of the group and hold onto yellow (Strava). Stage 3’s crit was pretty aggressive, and I looked like I had it all but locked up until there was a crash in the very last turn. Of course the guy that was in 2nd place in GC (Edgar Stepanyan – a former Jr. World Champion on the track, apparently) was in front of the crash and won the stage, earning extra time bonuses. I finished the race without crashing, but there was a chance I was going to lose the overall win because I got stuck behind the crash (Strava). There were some very anxious moments before I found out that the refs “neutralized” the finish, which meant I would get to keep the yellow jersey and take the overall! Next up for me was the Dan Point Grand Prix – another crit. This was the first time I tried racing two races in one day. I first competed in the 30+ Cat 3/4 field, which I won thanks to a 30+ minute solo breakaway (Strava)! I was happy to get that win, stay out of trouble (there was a terrible crash in the bunch sprint for 2nd place in that race) and win a bunch of free beer! The next race I did was the Cat 2/3, which was about an hour later, and after that long solo break in the first race, my legs were pretty toast (Strava). Still, I’m happy I did that one because it was my first time experiencing the speed of a Cat 2 field. With these two wins, I now had 20 of the 30 points required for the Cat 2 upgrade. I knew the Mt. Hamilton Stage Race would be an excellent opportunity to get the remaining points. This stage race was actually four stages over three days, with a hilly circuit race on stage 1, an epic road race that starts with a climb up Mt. Hamilton on stage 2, an uphill TT on stage 3, and then finishing up with a crit. I rode real strong that weekend, with victories in the circuit race (Strava), road race (Strava – 45 mile solo break away!) and the TT (Strava). In the crit I rode defensively to secure the overall victory (Strava). Stage 1 victory in Mt. Hamilton Stage Race’s Livermore Circuit Race. I now sat at 35 of the required 30 points for the Cat 2 upgrade. I thought a bit about if I wanted to keep racing more Cat 3’s for “experience” and potentially more race victories, but I came to the conclusion that moving up to Cat 2 racing was what got me excited to get out and train on my bike. In the immediate future (like, tomorrow) I will be racing in my very first P/1/2 field at the 805 Grand Prix, which consists of a circuit race on Saturday and crit on Sunday. I think I’m much better suited to a hard road race, but this will be a great opportunity to see how my skill level compares to the “professionals.” I’m not sure what racing will look like after that. I have my eye on Phil Gaimon’s Hill Climb Worlds up Gibraltar at the end of October, but any serious racing as a Cat 2 may have to wait until 2019. A quick update on the end of a long ?? ?road to Cat 4??? before getting in to my much shorter ?? ?road to Cat 3??? : After being denied early upgrade to Cat 4, I doubled up on my last races with a ???mentored??? crit in Redlands (which I won!) followed by CBR #2 (I was third and won a few primes). The Redlands race was a little far to drive for a ~25 minute race, but ?? ?Citrus Criteriums??? put on a great little event that I felt would be very helpful to anyone a little anxious about getting into crit racing or even bike racing in general. After those races, I applied for my upgrade and was granted a Cat 4 license. Woohoo! For my first Cat 4 race and first road race of the year, I headed a bit north to Cantua Creek in Coalinga. I think for most Californians,? ?they only know of Coalinga for its smell. It’s that place off I-5, in the middle of nowhere, with a huge cattle feed lot. Fortunately, the race started and finished up and over a hill a couple miles away from the feed lot, which is apparently too far for the stench to travel. Cantua Creek is a three lap out-and-back course that is mostly flat with a bit of climbing to end each lap. After an excruciatingly slow start to the race, I attacked up the first climb and got away. On the descent two riders bridged up to me. One was a junior that did very little in the break except to annoy the two of us, though kudos to him for getting in the break. He hung in for another lap, while the two of us did all the work. We put in another hard climb, and then it was just the two of us — Eric Sasse and I. We shared the workload well, and sort of had a silent agreement to wait for the hills at the end to decide the finish order. I raced the next day in the foothills of Fresno at a place called Pine Flat. Both of these races were about 70 miles from my brother’s home, so I stayed with him two nights and got to spend some time with him and my niece and nephew! Pine Flat is a beautiful place, and I regret not taking more pictures while I was out there. Eric and Gilbert were both in this race as well. This race starts off pretty rolly with some tough, short climbs followed by a long descent, some flats, and then two big climbs. After another slower start, Eric started some attacks for a break. The group chased him down the first couple times. I actually rolled off the front on a shorter descent, and then I saw Eric chasing with that junior from the day before in tow. Just as we were getting the break established, I looked back and saw Gilbert trying to bridge up solo. I immediately stopped working and things slowed down just enough for Gilbert to get on. It pretty much worked out perfectly and I was pumped! With those two races, I had a total of 12 upgrade points. I need 20 points minimum to upgrade to Cat 3, which I want to do before the San Dimas Stage Race at the end of March. In order to avoid racing too much, I needed to win?? my next race, and that race needed a minimum of 21 starters (the more starters = the more points). The UCLA Road Race this past weekend fit the bill. Cat 4 Done and Dusted! This week I received my upgrade to Cat 3! This little climb up the ranks has been fun, but I’m excited to be in some races where everyone doesn’t? ?expect me to win or be on the podium. I think I will be at a level now where I will be able to learn a lot from my fellow competitors and, hopefully, go? ?earn a few victories. For a variety of reasons ??? namely time and curiosity ??? I have decided to give bike racing a go this year. Triathlon is a great sport and I?? ?d love to have a calendar full of them, but it?? ?s just not realistic at this point in my life (9 month old baby!). In fact, towards the end of last year I had pretty much resigned the idea of doing any racing of any sort in 2018, but then I won the KOM challenge at Phil?? ?s Fondo, surprised myself week in and week out on the Simi Ride, and set a couple KOM?? ?s on former Amgen Tour of California segments?? (Aliso Canyon from Stage 7 of the 2014 tour and Norwegian Grade from Stage 8 of 2011), which all get me thinking???? ?maybe I can do some bike racing?! Of the three sports that make up a triathlon, there is no doubt that cycling takes up the most time. So why not stick to swimming or running you ask? I generally work a ???4-40??? work week, which means 10 hour days Monday through Thursday and Friday off. I have very little time for any training during the work week, and with my background, I can?? ?t skip four days of swimming in a row and expect to build any form. Running is similar, in that it rewards consistency in training. With my running background, I know I won?? ?t be setting any new PR?? ?s without a serious focus on consistent, high mileage run training. With cycling, however, I can pack in the hours as a typical weekend warrior and, it appears thus far, with pretty good results. And of the three sports, you can have the most fun as a ?? ?pretty good??? cyclist, vs. being a pretty good swimmer or pretty good runner. For those of you that??aren?? ?t familiar with the USA Cycling system, it is broken into categories: beginning with ???Cat??? 5 through 1 (and then technically there are pro categories beyond that). Each race is divided by categories (though they often combine two or three categories for smaller events), so you only compete with cyclists that are, in theory, at a similar level to you ??? everyone can have a competitive experience, from novice to expert. Everyone starts out as a 5, regardless of their background. In order to upgrade from 4 to 3, 3 to 2 and 2 to 1, you have to accumulate points by finishing well at races. To upgrade from 5 to 4, however, you have to complete TEN races. Ten! It doesn?? ?t matter how well you place, so long as you do the ten races. On Sunday I competed in my fifth race as a cat 5 (I did two races on a whim in 2016 and two more in 2017) at the Ontario ?? ?Ice Breaker??? Criterium. Cat 5 crits are infamous for crashes, as you might imagine with lots of inexperienced riders taking approximately 100 turns together. I kept near the front, until the last 5 laps where I broke away and rode to the finish solo. I honestly feel I don’t really belong in cat 5 (some of peers feel the same way, apparently — see below) and I’m anxious to upgrade soon. This Sunday I will be at the Dominguez Hills CBR to get some more experience and move one step closer to cat 4. At one of Neil Shirley’s “4 Days to Fitness” rides around New Year’s, I met Jason Francia who rides for Team Simple Green. I told him I was interested in doing more racing and he said I should look into joining Team Simple Green. I have only been a member for a few days now, so perhaps I will have more to share on the team dynamic in the near future, but I am excited to have some mentors in cycling and to have a team to be accountable to again. I will be rocking the bright green at the race this weekend! It’s still a bit too soon to say what I am hoping to achieve in my cycling racing. For now I’m just happy to be racing and training with a bit more purpose again.